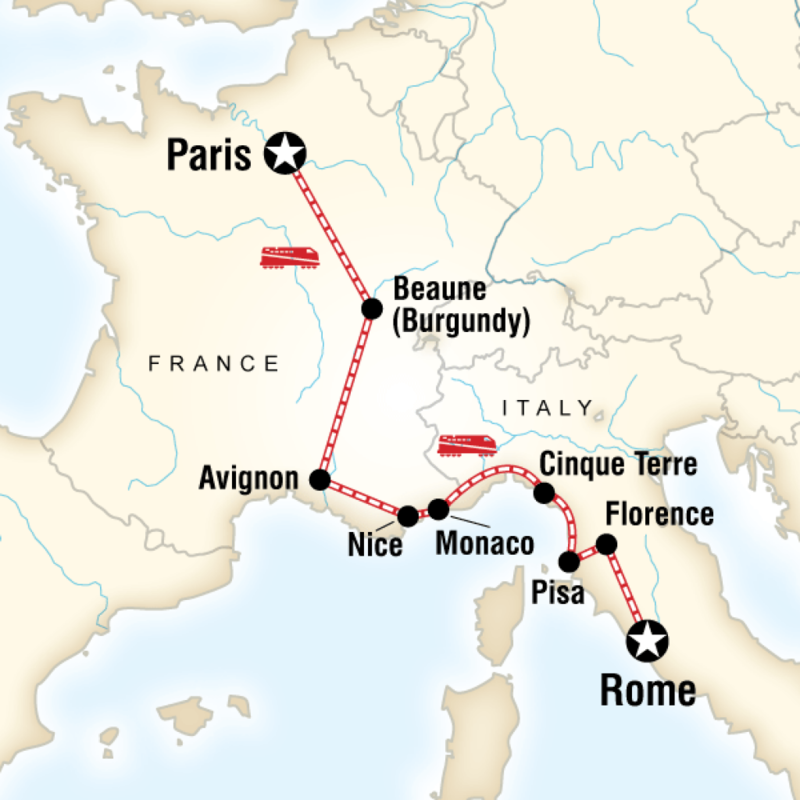 Sip wine in Burgundy, feast on local delicacies in Provence, follow scenic tracks along Italy’s Cinque Terre coast and raise your glass to the best of France and Italy. Over 13 well-paced days, travel from Paris to Rome and savour the region’s cultural and natural highlights. Your expert CEO will take the hassle out of travel and leave you with plenty of free time to explore. Witness the charm of Beaune and Florence’s great masterpieces, relax on the beach and fall in love with the beauty of this region. Arrive at any time. We recommend arriving a day or two early to fully explore this world-renowned city. Travel to Beaune and enjoy an included local wine tasting. Wander the town, shop, eat and, opt to visit the famous Hospices. With free time opt for a trip to nearby Dijon or visit the famous Hospices de Beaune. For a little more activity, head out into the countryside by bike or on foot to visit the vineyards. Travel south to Avignon in the heart of the Provence region. Visit the Palais des Papes and Pont St Benezet in this enchanting city. Travel to the Riviera town of Nice. Soak in the sparkling blue waters and explore the charming streets of the old town centre. Enjoy a free day to explore Nice or head down the coast to Monaco and Monte Carlo. Spend the day travelling along the beautiful coastlines of France and Italy to reach Riomaggiore, part of the Cinque Terre. Walk the coastal path between Riomaggiore and Monterosso or opt to take the train. Visit the charming, colourful towns along the way. Visit the leaning tower of Pisa en route to Florence. Enjoy an evening walk to Piazzale Michelangelo for a fantastic panoramic view of the city. Click here to find out more about our support in sustainable tourism.